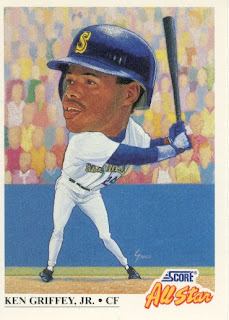 Since we are all getting a nice chuckle out of Chicle, I figured this would be a good time to remind Topps what cool looking cards actually look like. While not all of these are baseball cards, they were nice on the eyes and they looked like the player depicted, imagine that. 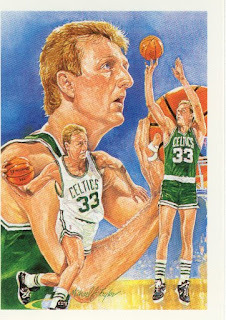 While I am sure that the artists of the Chuckle, err, Chicle cards are great there is something about that kind of art that isn't that appealing in a sports portrait. Don't get me wrong I appreciate the artistic aspect in that this is how they see the project and they are using their own vision which is what art is about, but in this case it is more about selling the product than the vision of the artist. I am sure in every other aspect of the artists' careers they are brilliant, but in this case..... not so much. When I was younger I collected basketball as much if not more than baseball for a while. Everyone at school was a Bulls fan, as was I at the time. 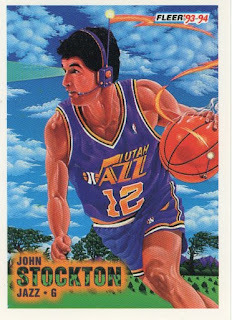 My favorite player was B.J. Armstrong, who was all of like 5'5 but he could sink a 3 from anywhere. If I were to get back into basketball again I would follow Chicago and that would probably be it, but I'm not so don't worry. I pulled out some of my other albums to scan some of these cards, most of which are from the early 90's and are still some of my favorite looking cards. 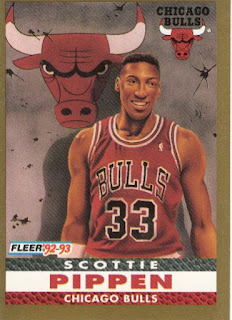 I would have scanned the Dream Team cards as well but I can't seem to locate that album. Besides I'm sure most of you either have them in your house or have seen them 500 times. 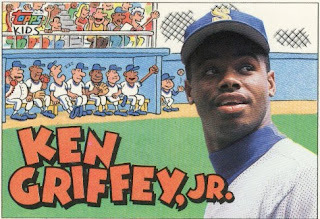 The vertical Griffey Jr. card is the only one out of these that was made by Topps as part of a kids set which the name escapes me. Maybe Topps should read this blog and find some of these guys to make them some cool looking cards, or call the Donruss people who did Diamond Kings. Or better yet, tell these artists to do something closer to these or at least represent the player accurately. Anyway, here are the cards that I like from years past. I'm sure most of you remember these (if you are over the age of 20 at least) and probably loved them. Gotta love my scanner, if I don't place the cards where it wants them, it crops my cards in the scan (grumble). 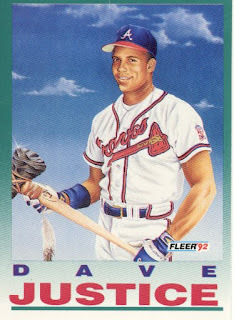 I used to love David Justice. This card was always one of my favorites. Would anyone else like to see cards like these re-surface? I know I would because it beats UD X and Ticket to Stardom that's for damn sure. 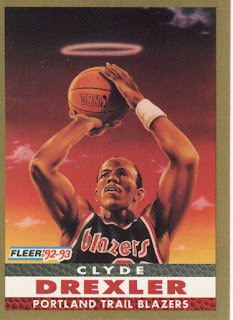 Ah, Fleer Pro Vision! Man, I really miss Fleer. 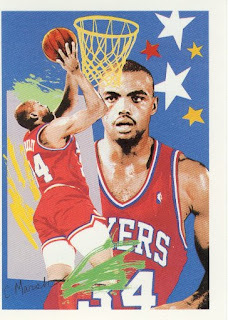 I used to like those "painted" fleer, and for photography, the early Score Dream Team were really different at the time. I run hot and cold on the Diamond Kings though.